This page walks you through the simple #USvsHate process. #USvsHate can start with as little as two class periods, or take as long as a semester or year. You can enter one of our contests, or all three! It’s about teaching one or more inclusion/anti-hate lessons, and then inviting students to make public anti-hate messages in any form. Publicly refusing “hate” jumpstarts the deeper learning we need to do to value all people in our diverse schools and society. We’re using Teaching Tolerance’s Social Justice standards, which invite students to explore identity, diversity, justice, and action! Each time you complete the process, you can ask yourself: What’s Next? What else do we want to learn and do in our school? — and start the process again. November 16, 2018, February 22, 2019, and April 26, 2019. Wait, what is #USvsHate again? #USvsHate is a youth and teacher empowerment project that engages teachers and students in creating and sharing public anti-hate messages. We seek to unite school communities against the recent hate surge, by catalyzing ongoing learning and action. See The Thinking Behind #USvsHate for a deeper discussion of what we’re trying to accomplish! 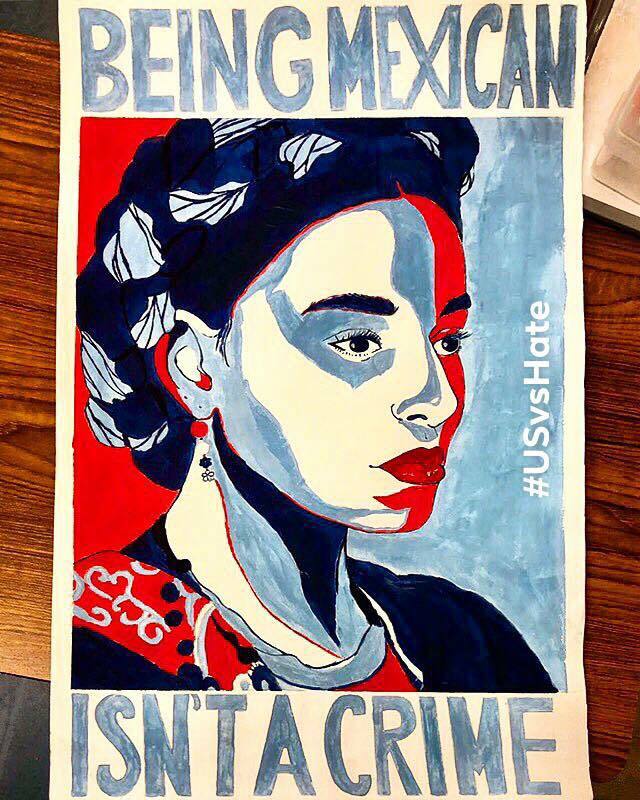 Sign up to join our community so we can contact you about student products and updates as we go along, and connect you to other educators trying #USvsHate! Read the Thinking Behind #USvsHate to get a deeper sense of what we are trying to do. Ask yourself: which issues of inclusion, equality, and respect do we most want to get students talking about in our school? Which of my own skills and knowledge do I most want to build? And most importantly, who should I invite to join me in this project? Frame the effort to administrators and potential partners. Share this website with educators who might be interested. Enlist the support of administrators. Explain that #USvsHate is an effort to help school communities unite together. This is not partisan; we are inviting all voices into a collective dialogue about inclusion and valuing people. Decide who is participating. You might consider teaching lessons in one or more classrooms, with lessons taught by teachers or counselors; in an afterschool club; or in a conversation hosted by staff in a school district. 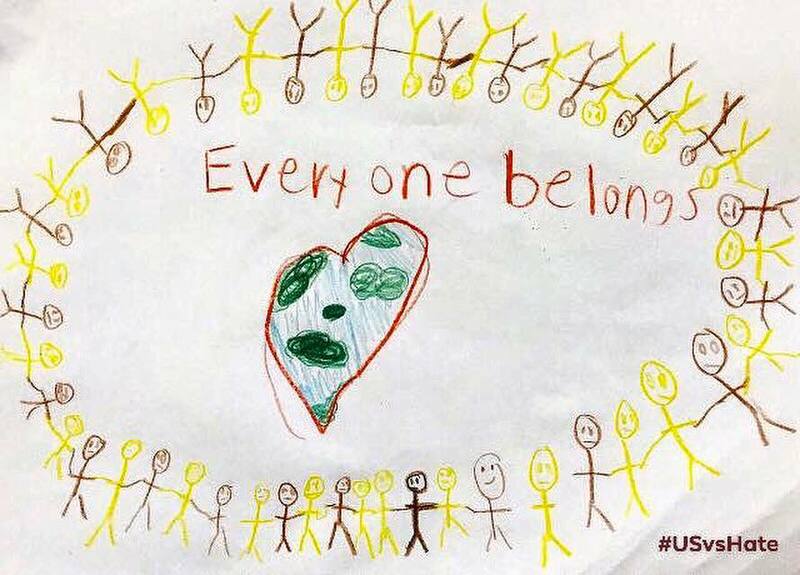 One pilot educator included parents in her #USvsHate activities. Some educators are trying lessons together in teams. Youth leaders are also leading some activities themselves. Review the lessons. It’s a gold mine, so give yourself enough time to read, choose, and flag resources to explore later! 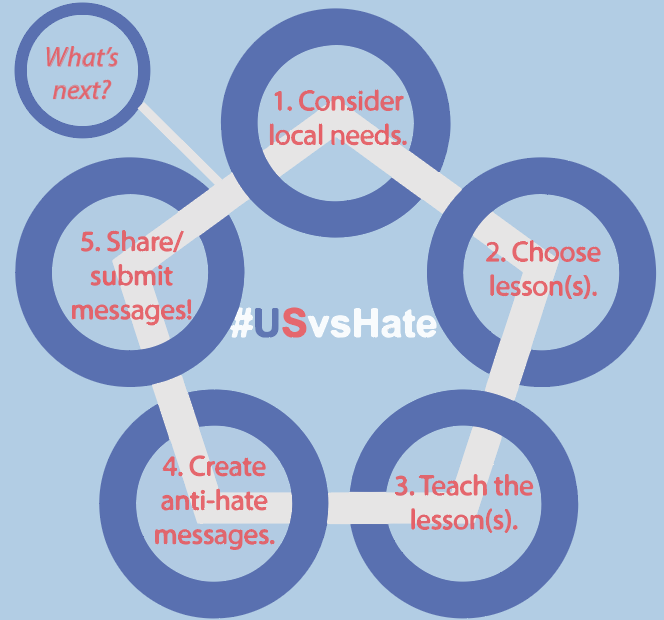 (You do not have to use #USvsHate lessons to submit anti-hate messages to our contest.) Whatever lessons you choose, build on what you are already doing! We have organized #USvsHate lessons into two sections. You can ask your students to make #USvsHate anti-hate messages after just one lesson. Of course, we’ve found that the best results come from a combination of lessons that drive home deeper points about valuing people equally – and that link to what you are already doing in your classroom, club, or advisory. See Teacher Stories for others’ experiences with specific lessons. Start where it works: choose lessons that fit your school’s needs, your curriculum, your preparation, and your student relationships. Remember the ultimate goals of #USvsHate: we want students to more fully know and value the people they share their school, community, and nation with, and we want to encourage students to take action against hate, bias, and injustice. Each lesson page offers suggestions for Before You Teach. Check out our Dialogue Tips and deeper resources for professional development as well! Invite students to create anti-hate messages to end any #USvsHate lesson, or to end a series of lessons. Each lesson list ends with suggestions for prompting messaging. You can also give students this Guide and let them run with it! Students’ anti-hate messages can be made in any media: hand-drawn or digital images, to become stickers and posters or be shared digitally; essays; poems; performances or public actions documented in photos or on video; videos or public service announcements; speeches; op-eds; tshirt designs; etc. An anti-hate message can be drawn by hand on paper, or created digitally using a phone or computer. A speech into a smartphone camera, a great letter to the editor, a poem, a photograph, or a school performance can be an anti-hate message! Don’t limit your creativity! Emphasize that messages can offer powerful words and powerful visual images. You don’t have to be an amazing artist or filmmaker. The real power is the message. To prime students’ messaging, you might ask students to find a poster, image, speech, video, poem, op-ed, public action, etc. that really speaks to them and consider what about it is so powerful. Students can make #USvsHate messages as individuals or in groups. ask people to treat each other kindly, fairly, and respectfully, so schools stay safe for learning and society includes us all. Emphasize that no message submitted should be harmful or hateful to others. #USvsHate! Highly recommended: facilitate a peer dialogue to help students improve their draft anti-hate messages for public sharing. Invite students to share their draft messages with peers for feedback. Possible norms: Don’t hate on anyone’s message! If you disagree with the message, address the message, not the creator personally. Find something about others’ messages that you can affirm and compliment in some way. Be both creative and original. Use original words and other material. Don’t plagiarize other people’s work or copy material off the internet. (If we can find an entry’s words or art already existing on the internet, it means it’s not original enough.) If you use others’ publicly available material, credit the creator whenever possible. A design could make a common slogan or style original, but our preference is new words and ideas. Do not use clips from music, videos, or other media copyrighted by others. If you use others’ publicly available material, credit the creator whenever possible. Successfully communicate the #USvsHate message of inclusion, to a group of peers. Share students’ anti-hate messaging locally. This is a CRUCIAL part of #USvsHate! 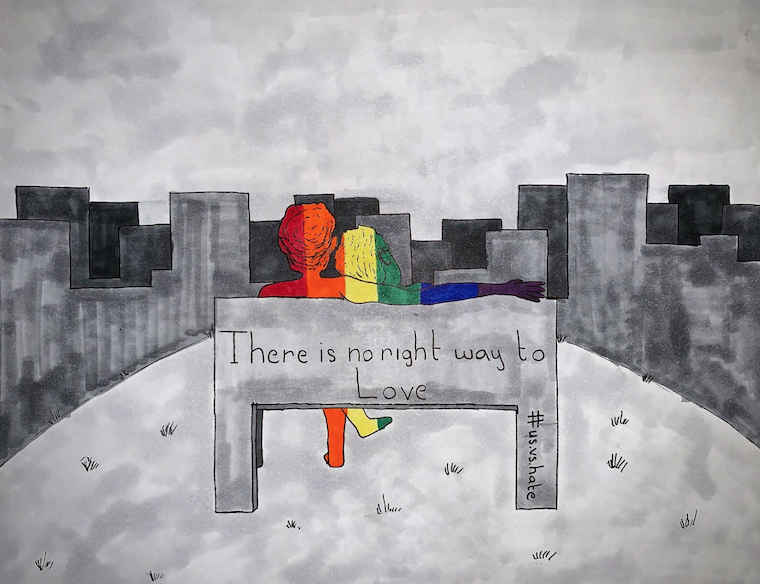 Regardless of whether entries “win” our contest, the world needs public messages countering hate and insisting on inclusion. Sharing messages locally also invites ongoing participation in lessons and learning long term. Teachers are sharing messages locally on school walls or websites, on school T-shirts, or via other school activities, like assemblies to highlight live speeches or theatre presentations. Then, submit “best” messages to #USvsHate for broader sharing in our November, February, or April message contests! We don’t limit contest entries; it’s your call how many you submit. Any message submitted will be considered for the upcoming contest. But don’t give us everything you have — submit just your best! IMPORTANT: For students under 18, parent/guardian permission is required for any entry submitted with a student’s name on it. Here’s a permission slip educators can use to get that parent permission. See Kim’s story on #USvsHate Teacher Stories, for how one educator handled permissions by email. Please make sure to add the #USvsHate hashtag. We encourage both individual submissions and group submissions that combine student skills! Winning entries (chosen by students and the #USvsHate team) will be amplified nationally via our website and social media. A subset will be made into free posters and stickers for participating classrooms. Check out our Fall 2019 winning messages, and our Fall 2018 contest winners! 6. Ask each other: What’s Next? Now, take the most important followup step of all: ask students and colleagues what they want to learn and do NEXT in your school community to tackle hate, bias and injustice. Is there a specific topic on the website that people want to explore? Is there a next action students want to take? Go for it! To figure out “what’s next,” you can ask students how the lesson and message-making affected them, and what they think is important to learn or do next. Please also consider submitting answers to our anonymous survey below. Let students know their take will help us make sure #USvsHate goes well for students this year, and inform future #USvsHate activities! You can copy any of our post-survey questions to Googleform or paper for your own survey. As a next step, many #USvsHate teachers have reached out to colleagues in their school to invite them to teach next lessons together. Please share your own thoughts with us on how #USvsHate went. Your take on our brief survey will help the #USvsHate team make any necessary adjustments to the #USvsHate process. We might also reach out to you for a Teacher Story, as well! Our goal is to refuse hate together — and do the deeper work to treat all as equally valuable! Questions? Email Mica Pollock, micapollock@ucsd.edu, ccing Minh Mai, mlmai@ucsd.edu.